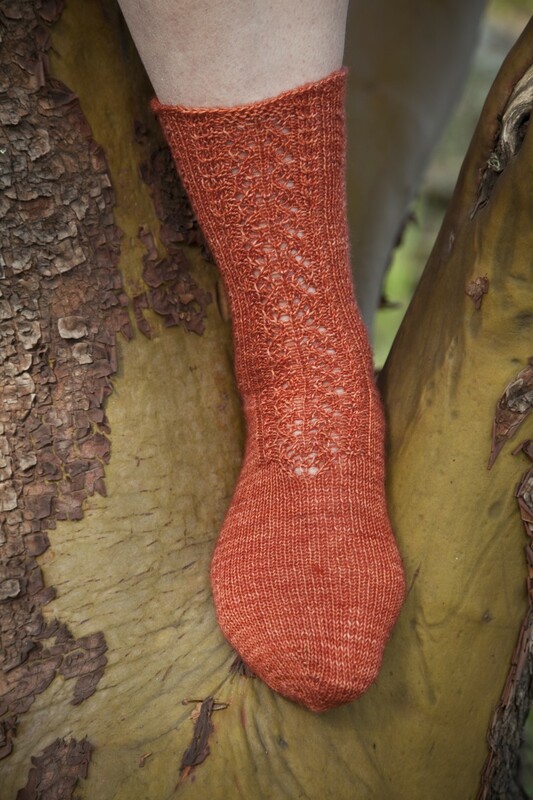 These practical, playful socks are the third design in my eBook, Cat’s Sweet Tomato Heel Socks. To purchase the entire eBook for $20 (read below for more information), click here. Or, if you prefer to buy just this single sock pattern for $6, click here. You will have the choice of paying by Paypal or by credit card. While I was teaching at Needlework Unlimited in Minneapolis, Minnesota, they received their first shipment of a locally hand-dyed Blue-faced Leicestershire sock yarn. Hardly a skein of this seductive yarn was left by the end of my workshops. It’s slightly over-spun (which bodes well for durability) and has lovely stitch definition. The moonlit colors inspired this delicate, lacy sock. 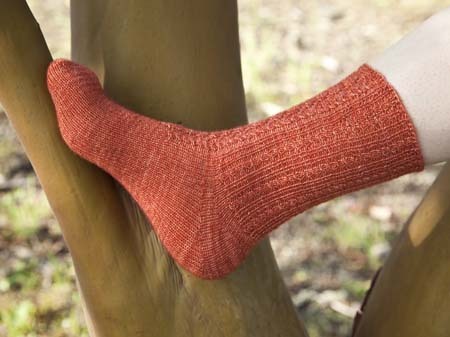 The sock features my Sweet Tomato Heel, which emerged last winter after several days of sitting beside the wood stove with my mother while trying to fiddle my way towards a new short-row heel. I’d given up several times when almost unconsciously, I did a small thing—and just like that, the clean heel of my dreams existed. This small thing closes gaps without holes, wraps, or acrobatics. The heel is rhythmic to work and nearly perfectly smooth, like a tomato. Best of all, once the process is understood, a knitter needs no written instructions.